Ariel Winter shined in a pink backless jumpsuit on Saturday, after hitting back at body-shamers who criticized her for revealing too much skin. 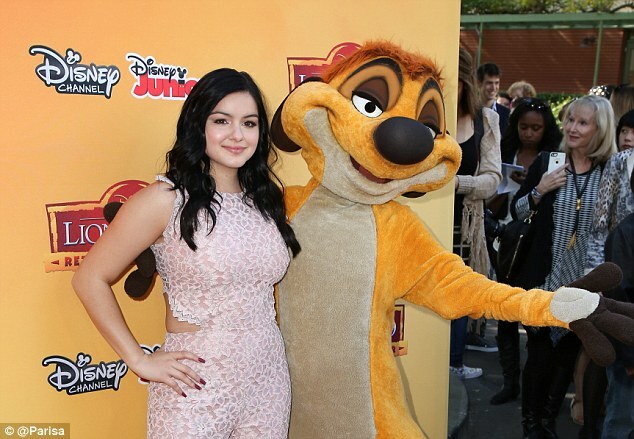 The 17-year-old looked lovely at the premiere of Disney Channel's The Lion Guard: Return Of The Roar at Walt Disney Studios in Los Angeles. Winter has been feeling more confident since undergoing recent breast reduction surgery but was criticized for a photo she posted of herself in a bikini with her two young nieces on Friday. 'It sickens me to think at 17 years old, a photo of myself with my nieces is suggesting that I'm "asking for it"' she wrote. Winter stood her ground and made an appearance at the event donned in a pale pink one piece jumpsuit, with cut-out sections across the back and sides. She left her silky raven mane flow past her shoulders and kept her accessories to a minimum.